Idle reduction describes technologies and practices that reduce the amount of time drivers idle their engines unnecessarily. Reducing idling time has many benefits, including reductions in fuel costs, engine wear, emissions, and noise. Drivers idle for a variety of reasons, such as to keep vehicles warm, operate radios, or power equipment. Each year, U.S. passenger cars, light trucks, medium-duty trucks, and heavy-duty vehicles consume more than 6 billion gallons of diesel fuel and gasoline — without even moving. Roughly half of that fuel is wasted by passenger vehicles. 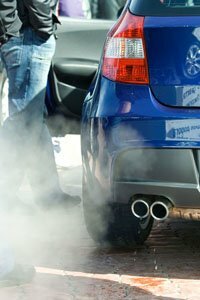 Idling is expensive — Idling uses up to a gallon of fuel per hour depending on vehicle size/model. Idling uses more fuel than does restarting your car — Idling for more than 10 seconds uses more fuel and produces more CO2 than does stopping and restarting your engine. See Which is Greener? Idle, or Stop and Restart? from Argonne National Lab. Modern cars warm up faster by being driven than by idling. Turn off your vehicle when you are not moving. Warm up your car by starting it and gently accelerating, not by idling. Park and walk in to an establishment rather than using the drive-through window. Downloadable fact sheets, posters, presentations, pledge forms and more are available at the US Dept. of Energy’s IdleBox Tookit. Signs and other printed materials are available free of charge by contacting Bill Eaker, CVC Coordinator. City of Asheville’s Fuel Conservation Policy. Toolkit for schools and school districts from Earth Day Network includes sample policies, newsletter articles, data collection sheets, lesson plans, etc. Short video summarizing the issues at schools and with children, produced by the Triad Air Awareness program. National Idle Reduction Network News provides a monthly e-newsletter. Reducing Unnecessary Idling Presentation (from WNC Aging and Environmental Health workshop, 5-20-15). Also available as a PowerPoint presentation. Article from Utility Fleet Professional: How Standing Idle is Setting You Back. Article from Today’s Trucking: How to Cut Idling Costs, Humanely. Ricker Trucking Company that is based in Madison County, in 2010 secured a NC Division of Air Quality (NC DAQ) diesel emission reduction grant with our assistance to purchase and install Auxiliary Power Units (APUs) on 11 tractor trailers. These APUs in 2014 saved collectively 17,419 gas gallon equivalents of petroleum for the year. NC Division of Air Quality’s Air Awareness Program launched an Idle Reduction Campaign in NC in 2010. 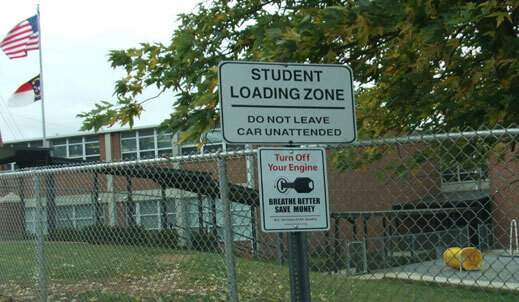 Idle Reduction signs are provided by the NC DAQ to interested schools and other entities. Stakeholder WNC Regional Air Quality Agency worked with Buncombe County and Asheville City Schools and erected signs at 47 schools. The WNCRAQA, NC DAQ and Coalition staff also teamed up to promote this program across the region. Signs have been provided to and erected at schools in Henderson (15 schools), Haywood (14 schools), and Madison (2 schools) counties. This program in 2014 saved 14,345 gas gallon equivalents of petroleum for the year. All county school systems passed idle reduction policies in 2005, as recommended by the state. Haywood Community College also erected a dozen signs on campus as part of their sustainability program. NC DAQ has produced an idle reduction brochure that includes links to a DAQ Idle Reduction website. The brochure is being distributed to schools and the public at community events.